Ever since the Champions League Draw at the end of August, there has been a name that freezes my blood cold whenever I hear it: Zenit St. Petersburg. And just because they lost their first match 3-0 to Malaga doesn’t help it, either, it just makes me fear Malaga, too. I don’t know if it’s Spaletti’s creepy facial hair, or the fact that they used their bottomless money pit to “reinforce” with Axel Witsel and Hulk at the end of the transfer market, but the forecast for Milan is not very good. Speaking of forecasts, the only thing on our side is that the Russian leg is early enough in the season that we don’t have to play in blizzard-like conditions. In fact, the forecast for tomorrow is a high of 58°F. And playing in Russia, we play at 6pm local time instead of the usual 8:45pm, so that’s a plus, too. But that’s it. That’s the only breaks Milan are getting. Our “improving” Budget Milan™ side will face a squad with the aforementioned Hulk and Witsel, but also such players as Bruno Alves, Domenico Criscito, Aleksandar Lukovic, Sergei Semak, and Aleksandr Bukharov. (Has your blood run cold yet?) Add to that Luciano Spaletti, who I’ve always rated highly as a manager. Since he signed on in 2009, he has won the Russian Premier League in 2010 and 2012, the Russian Cup in 2010, and the Russian Super Cup in 2011. That would be twice as many trophies as Allegri in the same time. After being dominated by Malaga in the first game, they have to be smelling blood looking at our horrible league start. In the meantime, they have a record of 5-3-2 in the Russian Premier League. So they are definitely not invincible, but I think it will take a miracle for us to win or even draw, especially in their house. 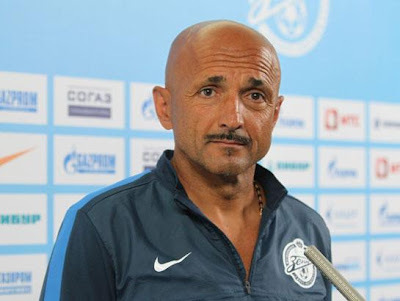 Against Malaga, Spaletti fielded a squad of Malafeev; Anyukov, Bruno Alves, Lombaerts; Shirokov, Zyryanov, Fayzulin, Lukovic; Denisov, and Hulk; while against Lokomotiv Moscow on Saturday, it was Malafeev, Aniukov, Bruno Alves, Criscito, Lombaerts; Shirokov, Zyryanov, Faitzulin, Bystrov; Bukharov, and Hulk. I’d venture to guess their bench could give us a run for our money. Is there enough European level magic in this squad for an upset? So, Allegri will have to make some magic if we stand a chance at all of even a point out of this match. He will have to pick the perfect lineup and the perfect formation, say lots of prayers, and still be hopeful. I’m going to guess he’ll go with Abbiati, Abate, Mexes, Bonera, De Sciglio; De Jong, Ambrosini, Nocerino; El Shaarawy, Pazzini, Boateng. Except I rarely get even 8 players right, Allegri is stubborn but will randomly surprise, too. It's strange to think that a year ago we would have been competitive or maybe even favorites in this match, now we are absolutely unquestionably the underdogs. When I think about this match, I shake in my boots, my teeth chatter, and chills run up and down my spine, almost as if I was in St. Petersburg in the dead of winter. But they aren’t invincible, and we are due to shock the world. If a game’s result were written in stone beforehand, we wouldn’t need to play the match. So grab some vodka, I’d really start drinking now, and grab a blanket, this one is going to be scary. But if we can manage even a draw, it will be a success, and then we can drink to celebrate instead! FORSHZA MKLILAN! This post inspired by a very strong desire to start drinking... a lot.